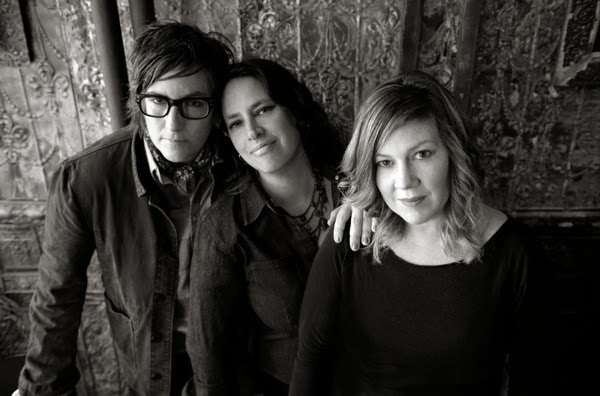 Luscious Jackson were one of the coolest bands of the Nineties: four women making rock music with a heavy accent on the groove, an ideal soundtrack for hot days with cold drinks. 1996's Fever In Fever Out album went gold, but they broke up in 2000 when Capitol Records was disappointed with the performance of the followup, Electric Honey. "We said there's no point in touring — nobody's supporting this," remembers singer/bassist Jill Cunniff. "The final indignity, after all those years of partnership and working so hard, was that as a consolation prize, they sent each of us a clock radio." The band stayed in touch — "not super-close, like we were hanging out all the time" — and briefly reunited in 2007 to record a children's album, but shelved it when they couldn't figure out how to release it without either having their own TV show or signing a painfully bad record deal. Four years later, though, singer/guitarist Gabby Glaser played the music for her toddler son and his friends, and discovered that the kids went nuts for it. In those years, crowdfunding had become a reality, so they got financing from fans via the PledgeMusic website. Although they plan to release the children's music soon, first they wanted to make a new adult album. While the band wrote most of the music themselves, "So Rock On" is based on a musical bed by Adam Horovitz of the Beastie Boys, an old friend; back in the Nineties, Luscious Jackson were the first band the Beasties signed to their Grand Royal label. Another standout track is "Are You Ready," which has kicking drums, chants that feel like a magical incantation, and a stylish acoustic-guitar breakdown. You can hear the pleasure of friends finding new life in an old collaboration. All the members of Luscious Jackson have children now, so they want to keep live dates to weekends. (The first two are November 23, at Philadelphia's Union Transfer, and December 7, at New York's Webster Hall.) "Maybe a quick four-day thing, or festivals — we can pull that off," Cunniff muses. "But everything has to pay for itself — there's no tour support." The band take pride in running the show themselves: "All records deals are bad" is their new mantra. "Right now all the stuff from the pledge drive is in my house. I have to print a hundred international labels, and I'm packing 550 CDs. They're all over the living room, and I'm pulling my hair out," Cunniff says. "We have a website, lusciousjackson.us, and I uploaded everything myself to tunecore. It should work. If it doesn't, I'm going to have to answer to my band."